There are 4 Summer Workshops for children being held in the gallery this summer on Wednesdays from 11am-1pm, these have been funded by the Friends and The Arts Society Kennet & Swindon and have proved very popular. and some photos I took of the prehistoric people being dressed up rather interestingly and standing in front of their dwellings. and with this child, they thought I wanted to photograph their hands! The next workshop is the one sponsored by the Arts Society and encouraging children to build colourful landscape pictures. 'Join us for a FREE day full of archaeological activities for all of you interested in what might be buried beneath our feet! There will be Archaeology talks (at 12noon, 1pm & 2pm) with our experts to celebrate the improvements to our Archaeology Gallery and for you to find out more about Swindon’s rich archaeological collection. 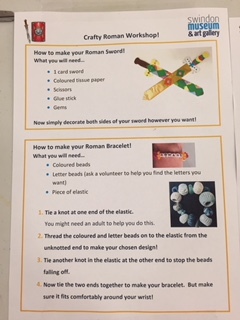 You can also ‘get crafty’ with our free children’s workshop where you can make your own Roman Sword or spell your name out on a beaded Roman bracelet. Cotswold Archaeology will also be with us on the day to identify any small finds you have hidden at home. Bring along any interesting artefacts you’ve unearthed and our experts may be able to tell you what it is. And, if all of that wasn’t enough, Wessex Ulfolc, an early medieval reenactment group, will be with us, bringing history to life. And don’t forget, it’s all FREE! outside refreshments from Coffee and Flowers along with some great house plants and flowers, they're a really interesting small Swindon based business. Mike Yates recently curated a ceramics' exhibition at Swindon Museum and Art Gallery, kindly loaning many of the ceramics in his personal collection to the show. The result was a fascinating collection of ceramics which got first place in Ceramic Review's top shows list, and attracted many visitors to come and look at it. The museum's curator Sophie Cummings kindly agreed for the exhibition to remain in place for another two weeks to enable us to ask Mike to give a talk about it, which he kindly did last week despite almost losing his voice. The talk covered some major collectors, Mike's experience of collecting and his knowledge of ceramicists and how museums have acquired ceramics collections. I took a few photos which I'll add here, and then below the photos are some handy notes giving details of the talk. Above Slide of Bernard Leach pot with iconic 'leaping salmon' decoration, and below Mike Yates with a table behind him laden with more ceramics from home. Above slide of William 'Bill' Ismay and a small part of his collection, and below Slide of cutting from 'The Times'. Lucy Rie and Hans Coper pots from the Alan & Pat Firth collection. Unfortunately this slide hasn't come out very well at all, but this almost shows Mike holding an African pot from the Nupe people of central Nigeria, two things to note, the pot has a round base and so had to be placed in sand to be upright, and also the casual way in which Mike was holding it with one hand!! Below a slide showing Peter & Margaret Thomas' studio, Tweedmouth, north Northumberland. I've included this because anyone in the audience I'm sure would want to visit this studio. Mike brought two of the Thomas' jugs with him, the one seen below tells part of a story of Mike and his wife Emma's life on the jug. Mike began by outlining the lives of three ceramics collectors, Eric Milner-White, Dr John Shakeshaft and William 'Bill' Ismay. Milner-White, a cleric, bought his first ceramic piece in 1925. His collection contained important works by William Staite Murray, Bernard Leach and Shoji Hamada, the Japanese potter who had helped Leach set up the Leach Pottery in St Ives. When he died Milner-White was Dean of York Minster and he left his collection of some 350 pots to York City Art Gallery. John Shakeshaft was an astrophysicist at Cambridge University who began collecting ceramics in the early 1970's. He left his collection to the Fitzwilliam Museum, Cambridge. William 'Bill' Ismay, a Wakefield Librarian, was possibly the most important collector of 20th century British studio pottery. He knew, and visited, countless potters in their studios and built up a collection of some 3, 600 pieces from over 500 potters, which he kept in his small two-up, two-down terraced house. Bill died in 2001 and his collection went to the Yorkshire Museum, near York. Shortly after Bill Ismay died, it was decided that his collection should join the Milner-White collection and funds were raised to form the Centre of Ceramic Art (CoCA) in York, which opened in 2016. Anthony Shaw, a London-based collector gave over 800 items from his collection 'on permanent loan' and these pieces formed one of CoCA's opening exhibitions. Another early exhibition was of ceramics which had been decorated by Pablo Picasso. This collection, some 100 items, had been formed by Richard Attenborough and his wife, who would visit Picasso during their annual holidays in the south of France. Mike pointed out that many people believe that collecting is a male only obsession, but Lady Attenborough had been actively involved in building this collection. Ann Carr was another collector who knew the potter Michael Cardew - she allowed Cardew to use her house on the Greek island of Naxos when he wanted to write his autobiography - and she bought many of his later works. These were left to Aberystwyth University who already had a large collection of Cardew's earlier work. The Swindon collection had also benefited from the generosity of two ceramic collectors, Mark Golder and Brian Thompson, who have donated a large collection of contemporary pieces to the Museum - a wonderful gesture. Mike then mentioned two important private collections which, sadly, were not left to public institutions. The first had been formed by Mike O'Connor, Head of Art at Christ's Hospital School, in West Sussex, the second by Alan and Pat Firth. 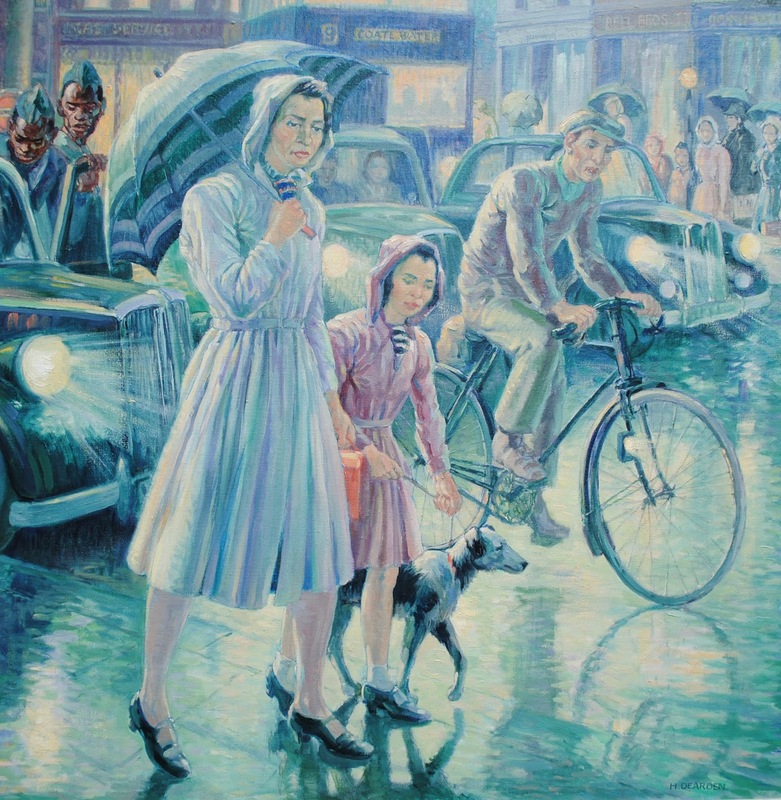 The Firths' began collecting in the mid 1960's, firstly buying a work by Hans Coper, which they found in a Stratford-upon-Avon craft shop. They had spent £27,000 on their collection, which sold at auction for just under one million ponds. Ian Auld, one-time Head of Ceramics at Camberwell School of Art, Ian's partner the ceramic artist Gillian Lowndes, and Margaret and Peter Thomas were, as Mike explained, the four people who taught him most about ceramics. We were shown beautiful examples of their work and it was obvious that these were treasured items to Mike. Mike told us that Peter Thomas had suggested various other potters whose work Mike might like and it was this that set Mike on his own collecting journey. Finally, Mike just had time to briefly mention the current ceramics exhibition, "Timeless Secrets", which he had been asked to curate. During questions, Mike was asked which potters he would suggest that people could collect. He replied that people had to make personal choices and that it depended on what people liked! He has now added that would-be collectors might like to have a look at Alistair Hawtin's book "A Guide to Collecting Studio Pottery" (A. & C. Black, London.2008). Now slightly dated, it is nevertheless the best place to start.